Until midnight tomorrow the registration fees for the upcoming 2006 NMS Scientific Sessions: Nutritional & Metabolic Aspects of Carbohydrate Restriction remain discounted for early-bird registration. It's not too late to register to attend and learn about the compelling research that shows carbohydrate restriction is supported by scientific evidence as an option for those with many metabolic disorders including diabetes, metabolic syndrome, PCOs and obesity. While traditional conferences of this type tend to be exclusively attended by those within the research and medical communities, this one is also open to the public and industry! I strongly encourage those of you who are interested in controlled-carb nutrition to consider attending. There will be many presentations that are going to be easily understood by those who are not doctors or academic researchers and plenty of folks on-hand to answer any questions you may have! The registration includes all conference materials, an attendee welcome bag, your breakfast and lunch each day, snacks and a one-year membership in the Nutrition & Metabolism Society. The conference is in Brooklyn, New York - Janaury 20-22, 2006 and the hotel is even offering a discounted room rate! If you have the time and the budget, this is one conference you want to attend! Register today so you don't miss the discounted early-bird registration! Since starting this blog back in May 2005, I've tackled a number of subjects related to health, nutrition and lifestyle. With the vast majority of subjects, I've sought to bring my readers the scientific evidence in an easy to understand format. Occassionally I've offered my own opinions and thoughts on some things with the hope that such opinions make sense and are also based on my evaluation of the data available. Throughout 2005 research data continued to reveal how insidious inflammation is to our health. I'm not talking about the type of inflammation from a sports injury or when you bump your arm, but the low-level chronic type of inflammation that you don't feel and don't know is there until it's too late. Since May I've included information about the damaging effects of inflammation in ten articles, with the two most important being: Death by Inflammation and Inflammation and Metabolic Syndrome. 9 - Debate about Metabolic Syndrome - Does it Exist? Two of the leading health organizations in the United States are battling over whether Metabolic Syndrome is real or not. The American Diabetes Association issued a position paper stating that Metabolic Syndrome should not be a diagnosis unto itself and clinicians should treat the features considered part of the disorder rather than treat a cluster of symptoms. The American Heart Association took little time to issue their own position paper stating that Metabolic Sydrome is indeed a disorder to be diagnoised and treated - to ignore the clustering of features is a mistake for clinicians. A good article about the two sides of the debate is found in the October 10, 2005 Business Week. The government issued revised Dietary Guidelines for Americans and a series of Food Guideance Pyramids this year. While those who believe such guidelines are useful were quick to praise and promote them, I have written extensively about the flaws within them - namely the risk of failing to consume adequate intake of essential micronutrients, amino acids and fatty acids. In the article, Examining Low-Carb and Low-Fat Diets: Part 2, I compare, side-by-side, a low-fat menu and a low-carb menu to highlight the nutrient deficiency in the low-fat menu. It wouldn't be a stretch to say that the importance of protein in the diet came to the forefront of our understanding of satiety this year. A number of studies published continued to show the power protein has on feeling full and that when protein is increased in the diet, it is easier to stick with a weight loss program. In the article, Study Finds Controlling Carbohydrate Better, you'll find more information about the role of protein in the diet and satiety. Quite frankly, the DASH Diet is no longer the DASH Diet if you increase protein and reduce carbohydrate, but that didn't stop the headlines from proclaiming this "tweak" showed the diet was more effective with less carbohydrate! You can read more about this finding in DASH Diet Better with Less Carbohydrate. A large number of studies were published in 2005 that implicated fructose as a culprit in our obesity epidemic. In the article, Fructose and Obesity, I detail the results of a study that showed mice fed a steady diet of fructose had 90% more body fat than mice fed water, even though the mice consuming water ate more calories! Our children are not only growing more overweight each year, they're now starting to suffer the same diseases as their overweight and obese adult counterparts. Researchers are now cautioning that if we do not reverse this trend, our children will have a shorter life expectacy than we do. In The Future is Now, I detailed the findings of a survey investigating the incidence of overweight in children. The findings were scary! Many take for granted they'll consume foods that provide for their essential micronutrients in their diets each day. The research however continues to show that a number of vitamins, minerals and other essentials are critically low in our diets and some of the things we do in our daily life contributes to our inability to meet our nutrient requirements. Vitamin D is one of those critical nutrients that is tricky to consume in food and we can make with exposure to sunlight. My most recent article, Vitamin D is Critical for Health, discusses the finding that vitmain D can reduce risk of cancer and provides a list of foods that have vitamin D.
We hear a lot about the need for long-term data before we start considering different dietary approaches than those already recommended. This is especially true when it comes to low carbohydrate diets being recommended to those with metabolic disorders like Diabetes. This month, the first such "long-term" data was found in a poster published at the Nutrition & Metabolism Society website. You can find more about the research findings in Diabetics, Take Notice! Researchers conclude Low-Carb Diet is an Effective Treatment with 22-Month Data. In Connecting the Dots, I detail the review published in the journal Nutrition & Metabolism that found the features of Metabolic Syndrome are the very same list of things that reverse with a low-carbohydrate diet - high triglycerides, low HDL (good cholesterol), high blood sugar, high blood pressure, insulin resistance and obesity. Without a doubt, to me, this is the number one item for the year. With an estimated 25% of all adults in the US showing features of Metabolic Syndrome, these findings should be setting off alarm bells that there is something wrong with our diet and that there is something that reverses the problem - reducing carbohydrate! While the above represents those items I believe were the top ten for 2005, many more items could also be included - diabetics are not controlling their blood sugars as well as they should, tight control does make a difference for diabetics, the food industry seeks and gets protection for lawsuits in a number of states, etc. What the above highlights is that the research continues to show that our current recommendations for population-wide consumption of a low-fat diet are flawed. While such a dietary approach may be beneficial for some, it certainly is not for everyone. I believe in 2006 we are going to witness a strong campaign to discredit and dismiss any dietary approach outside the current low-fat paradigm more strongly than ever before. Keep your eyes on the evidence, not the headlines. Keep your mind active and seek out the information to build your understanding of how your metabolism works and how what you eat does have an effect on your health. Eat well, eat nutrient-dense and most of all, eat to live well! Have a joyous and prosperous New Year! Here's to your health! Many of my readers may recall that I wrote back in June that 2005 is the year for insight into the critical importance of Vitamin D in our health. Today, MSNBC had an article, Study: Vitamin D lowers risk of major cancers, that drives home just how important this micronutrient is for our long-term health. The MSNBC article does a good job of presenting the results from the research. I'm just going to add here that the article did not include many of the foods that contain Vitamin D naturally, so I'll list some here. 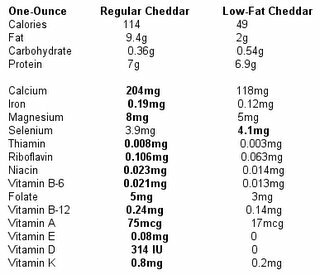 I do not include margarine or milk since both have Vitamin D added, but it is noteworthy that fortified milk products are also a source of Vitamin D in the diet. I do not, however, recommend margarine. This is not an exhaustive list, but interestingly, many of the foods above are the very ones we're told to avoid in our diets in the US. Even more interesting, at least to me, is the fact that many of these very foods are the same foods encouraged when one is eating a low-carb diet! While it can be tricky to get your Vitamin D from foods, it most definitely can be done. Supplements are also another way to boost your vitamin D intake - but remember, when vitamins occur in food they also occur with other vitamins, minerals and elements and these may be important to our ability to utilize the Vitamin D. So, from my perspective, it is better to try to get as much of your Vitamin D from food as possible, especially during the winter months when our exposure to sunlight is decreased. Sunlight, by the way, is of critical importance for humans to make Vitamin D - without it, or when we slather ourselves with sunscreen all the time, we're limiting our body's ability to make the Vitamin D it needs. This isn't to encourage reckless abandon in the sun - but to remind you that short-term exposure to sunlight is actually beneficial to your health. That means that in the warmer months, exposing yourself to sunlight, sans sunscreen for 20-30-minutes each day is beneficial as is allows your body to manufacture Vitamin D from the exposure to the UV rays. At least 89 articles appeared in the press since yesterday, claiming that research shows a diet that is high in fat can disrupt sugar levels and trigger diabetes. In the LA Times' article is titled, "Enzyme Study Links Fatty Diets to Diabetes." The opening sentences are pretty convincing: Diets high in fat can disrupt blood sugar levels and trigger diabetes, researchers said Wednesday in a study that helps explain the link between obesity and a disease typically linked to sugar. Fatty foods can suppress an enzyme crucial to the production of insulin, which regulates sugar in the blood, scientists at UC San Diego said. You guessed it, this wasn't a human study, it was an animal study. In this one, the participants were mice. The normal diet of a mouse is about 5% fat, 15% protein and 80% carbohydrate - a very different macronutrient (fat, protein, carbohydrate) mix than we humans eat. Now this isn't to say that animal models are useless or unable to provide useful data - they are and they have for years. The real problem here isn't the mice per se, it's the media jumping up and down to say the data shows a high fat diet is detrimental for humans. Just look at the headline again. Even the researchers themselves did not go that far! "In a study of normal mice that were fed a fatty diet, researchers found that the enzyme was repressed, leaving pancreatic cells unable to sense sugar levels and leading to diabetes. "Our findings suggest that the current human epidemic in Type 2 diabetes may be a result of GnT-4a enzyme deficiency," said Marth, adding that people who inherit a faulty gene may also be vulnerable to diabetes. It may also play a role in the early onset of Type 2 diabetes in children and teenagers, according to the study, which was also sponsored by the National Institutes of Health." I've bolded the important words above. "May" is not "definitive," nor is "suggest" saying that the findings are "definitive." Hey, if nothing else, we know if we feed mice a diet that is high in fat, they'll have problems. But, does the same hold true for humans? Quite frankly, it depends on the context - the mix - of the diet one is eating. If you're eating a large amount of carbohydrates along with a large amount of fat, I'd be the first to tell you you're heading for metabolic nightmares - this "opinion" is even supported by data. Just as the research data shows that if you reduce the carbohydrate and consume higher amounts of fat, well - metabolic disorders in humans tend to reverse - is also an "opinion" supported by data. And here is where I feel researchers are "missing the boat" when it comes to nutrition studies - they're still focused on macronutrient ratios and too focused on fat in the diet as a percentage of calories. As I've pointed out before, if you're eating 3,000 calories a day and trying to stay within 30% of those calories from fat, you'll be eating about 100g of fat each day. Now let's pretend you're overweight and need to lose 50-pounds, so you reduce your calories to 2,400 calories a day. Up until that calorie reduction you've eaten 100g of fat each day, within the "healthy" diet recommendations. If you decide to reduce your carbohydrate instead of your fat and continue to eat 100g of fat each day, the "experts" will now insist you're eating unhealthy, even if reducing your carbohydrate means you're increasing your intake of fresh vegetables while eliminating refined sugars and grains! Their reasoning is that you've somehow "increased" your fat intake because you're now eating 37.5% of your calories from fat instead of less than 30%. It doesn't matter that the glucose burden in your body has been reduced, thus reducing your insulin, by eliminating 150g of carbohydrate each day as your source of calorie reduction. Nope, you're now eating too much fat....even though you've now reduced your calories and reduced your body's need to shuttle sugar around and store it when it's in excess amounts. If the arguement is that calories in calories out are at the heart of weight loss, why then this obsession with dietary fat? Why not offer those who are overweight or obese - or even pre-diabetic or diabetic - an option of what macronutrient they find easier to reduce to reduce calories each day? For those who are pre-diabetic or diabetic (type II specifically) the research shows that reducing carbohydrate is effective - not only for weight loss, but for improving insulin sensitivity, reducing fasting blood glucose levels, reducing LDL (bad) cholesterol, increasing HDL (good) cholesterol, reducing triglyerides and providing a greater feeling of satiety when followed correctly. Data - from studies specifically on humans - show that higher percentages of dietary fat & protein with a lower percentage of carbohydrate calories offers many diabetics and pre-diabetics the ability to lose weight and reduce the features of their metabolic disorders. Yet we remain stuck in this thinking that one must reduce dietary fat to lose weight or to improve their health! As I wrote about just a few days ago in Diabetics, Take Notice! Researchers conclude Low-Carb Diet is an Effective Treatment with 22-Month Data, we're now seeing longer-term human data and it is showing promise that low-carb diets are an effective dietary therapy for diabetes. Which begs the question - if you're diabetic, which would you rather trust - human data or animal models in trying to determine the best course of treatment, with diet, while working with your doctor to monitor your progress? That was the question posed to Congress by Dr. Phil Handler, back in 1980 when he was the president of the National Academy of Sciences. Just what "experiment" was he talking about? At the time, the United States had a fairly constant 13-14% of the population classified obese. Today, some 25-years later, we are living with the reality that two out of every three Americans are overweight and one of the two is obese. We've experienced a rise in obesity from a steady, predictable 13-14% to what now stands at one-third, 33%, of our population obese. That alarming statistic isn't declining either. In fact, our children are now experiencing obesity rates that rival the adults along with the detrimental health effects too - heart disease, type II diabetes, metabolic syndrome, high blood pressure, high cholesterol, etc. Yet, the consensus opinion holds that the low-fat dietary recommendation is the ideal and we must remain steadfast with our recommendations. To question the low-fat diet is outright heresy. The belief that the low-fat diet is optimal is so strong that anyone who even voices concern runs the risk of public ridicule or worse, has their personal integrity and intellectual honesty questioned. Take as an example, today's article in The Age, Peers turn up heat on CSIRO diet. The article reports an editorial published in Nature that questions the integrity and intellectual honesty of two researchers - Dr. Manny Noakes and Dr. Peter Clifton - from CSIRO Human Nutrition (Commonwealth Scientific and Industrial Research Organisation, Australia). What exactly have they done to earn the scorn of their colleagues? They wrote the book CSIRO Total Wellbeing Diet - a high protein dietary approach based on their research findings. The book arose out of eight years of CSIRO research into lowering the risk of heart disease, during which it encountered the absence of scientific facts on the truth behind weight loss. This wasn't a book borne out of a six month study, or even a one or two or three year study - it was eight years of scientific research! Eight years of data that supports the authors' recommendation that a higher protein diet is effective and safe. Yet, the critics contend that "The hype goes beyond what the research proves," said Jim Mann, from the University of Otago. Where exactly is the proof that a low-fat diet is healthy? I've said it before and I'll say it again - to date there is NOT ONE long-term, randomly controlled study ever done to investigate the effects of a low-fat diet on human health over a long period of time. Even after repeated attempts to prove a low-fat diet is supported by scientific evidence, the government abandon trying to document such since there is not enough evidence to even cobble together a half decent paper to make that claim! In fact, there exists MORE data telling us about the effects of various carbohydrate restricted diets - low-carb, controlled-carb, low glycemic index, high protein, etc. - than a low-fat diet at this point in time. Even the beloved DASH Diet, promoted by the NIDDK (National Institute of Diabetes and Digestive and Kidney Diseases of the National Institutes of Health) was found more effective when carbohydrate was reduced and protein was increased! The low-fat doctrine was questioned 25-years ago by one of the nation's leading health experts at the time. He warned reducing fat in the diet was a grand population-wide experiment without solid scientific evidence to embark on with - he was ignored. Today we're living the results of that experiment - as a nation we're fatter than ever before and our health is worse. If this does not anger you, I don't know what will. You've been had - the emperor has no clothes! The dietary recommendations we've listened to for the last 25-years, I contend, are directly contributing to our growing obesity and declines in health. It's time to stand up and say ENOUGH - show me the long-term data that proves a low-fat diet is healthier than a diet that has fewer carbohydrates, show me the data that shows a controlled-carb diet is unhealthy! They can't. They won't. But they will continue to dazzle you with dogma and claim the evidence supports their recommendations. They'll continue to repeat the low-fat mantra to try to convince you without any evidence! Don't be fooled by it. Take the time in 2006 to educate yourself about how your metabolism works, what foods are nutrient-dense and how controlled-carb diets work. Don't just take my word for it - it is your future - use 2006 to take back your life and your health! Then watch throughout 2006 as the diet debates heat up, as more and more researchers are targeted as heretics with their integrity and honesty questioned. It is going to happen and it will be nasty as the evidence continues to mount that a low-fat diet is not optimal for population-wide recommendations. Those who are bringing forth such evidence are exposing the naked emperor for his lack of clothes and risking embarassment to those who insist he is clothed. This isn't the first time that science has undergone such radical shifts - in fact, it's part of the scientific process of inquiry and learning. You just don't have to wait for it to happen - the evidence is there that controlled-carb dietary approaches work and offer an alternative. If you're not convinced, wait and see! Researchers from Sweden have been following the progress of two groups of Type II Diabetics assigned two different dietary approaches for 22-months. The first group was assigned a low-fat diet that consisted of 55-60% carbohydrate, 15% protein and 20-25% fat - this group served as the "control group." The second group was assigned a low-carbohydrate diet that consisted of 20% carbohydrate, 30% protein and 50% fat - this group served as the "study group." The results after the first six months and one year were promising for the low-carb diet group - as the researchers stated in their conclusions at that point in time: A low-carbohydrate diet is an effective tool in the treatment of obese patients with type 2 diabetes. This was based upon the finding that, [p]ositive effects on the glucose levels were seen very soon. After 6 months a marked reduction in bodyweight of patients in the low-carbohydrate diet group was observed, and this remained one year later. After 6 months the mean changes in the low-carbohydrate group and the control group respectively were (+/-SD): fasting blood glucose (f-BG): -3.4+/-2.9 and -0.6+/-2.9 mmol/l; HBA1c: -1.4+/-1.1 % and -0.6+/-1.4 %; Body Weight: -11.4+/-4 kg and -1.8+/-3.8 kg; BMI: -4.1+/-1.3 kg/m_ and -0.7+/-1.3 kg/m_. But - the data was only for one year and thus not "long-term" and therefore summarily dismissed by many as irrelevant. It did not matter that those diabetic patients following the low-carb diet were doing BETTER than those assigned the low-fat diet - what mattered was that they hadn't followed the low-carb diet for more than a year. This did not discourage the researchers! And, I for one am glad they continued to follow these patients. Now, after 22-months, we have a better picture of just how well those following a low-carb diet are doing. They're not just doing well, they're still doing better than those following the low-fat diet! As the researchers point out in their results section: The mean weight has increased from month 6 to months 22 by 2.7 ± 4.2 kg. Seven of the 16 patients retained the same bodyweight from 6 to 22 months or reduced it further. Mean HbA1c which, after 6 months, was 6.6 ± 1.0 %, was 6.9± 1.4 % after 12 months and was still 6.9 ± 1.1 % at 22 months. Because of the reduction in bodyweight and insulin resistance, a reduction in cardiovascular risk would be expected at some point. We examined medical charts for episodes of cardiovascular disease from 3 months after the initiation of the diet therapy – when an effect might be detected -- and forward. Three episodes of cardiovascular disease occurred among the 5 patients that did not change their diet. The 16 patients in the LCG and the 10 from the CG that changed diet – totalling 26 patients -- have been free of cardiovascular disease during the follow-up period (p = 0.002. Fischer Exact). Their conclusion again: A low-carbohydrate diet is an effective tool in the treatment of obese patients with type 2 diabetes. I don't know about you, but if I were diabetic, I'd be asking my doctor why I'm being told to eat a low-fat diet and demanding to see the long-term data that shows it more effective than a low-carb diet. I'd be demanding to know why I'm being told to adjust my medications instead of my consumption of carbohydrate! Then I'd be demanding the American Diabetic Association (ADA) start to take this dietary approach seriously and begin to craft an evidence-based guideline for my doctor to use in my treatment so I could reduce or eliminate many of the medications and/or insulin injections each day! I'd be telling them I'm tired of just managing my disease with pharmaceuticals - I want to be able to be free of the costly prescriptions and injections, and if a low-carb diet offers that as a possibility, it must be one of the options I am told about and offered as a management tool for my disease! Folks, many believe the low-carb diet has been relegated to the dust-bin of fad diets that have come and gone. Nothing could be farther from the truth! While the low-carb dietary approach may have lost its luster for the media it remains a strong candidate as a dietary approach for the management of diabetes, metabolic syndrome, high cholesterol and other metabolic disorders. It may have fallen out of favor with the popular press, but it is still going strong in research circles around the world. It's not often I totally rail someone in my blog. Today is, however, an exception. A dietitian and nutrition consultant in Chicago was a featured writer today at the WTOP radio website with the article, "Taking a bite out of the glycemic index trend." It is, without a doubt, a shining example of how the media misleads when it comes to advice about diet and nutrition because the writer does not do their homework. In this instance, Ms. Helm, the writer, tackles the increasing popularity of low glycemic index diets and, through carefully crafted buzz words, seeks to convince the reader the approach is worthless and and lacks the 'endorsement' of leading health organizations as a method to control diet for weight loss. In lock-step with the current party-line she believes that this lack of endorsement is some proof that low glycemic diets lack scientific merit and goes on to parrot recent opinions of research findings that claim the results show low GI diets offer no benefit. Dr. Susan Raatz, a researcher from the University of Minnesota Medical School, who recently published one study, Reduced Glycemic Index and Glycemic Load Diets Do Not Increase the Effects of Energy Restriction on Weight Loss and Insulin Sensitivity in Obese Men and Women, is quoted as saying "Calories are what really count, low GI is not adding any magic bullet to improve weight loss." I wrote an article about her study October 26, 2005 right here in this blog - Weight Loss: Glycemic Index (GI) and Glycemic Load (GL) - and paid to have access to the full text of her published research data. Guess what the data showed? You guessed it - low GI diets did indeed provide a benefit. Too bad Dr. Raatz doesn't have the guts to actually state the facts from her own data! The benefit wasn't actual pounds lost, even those those who followed the low-GI diet did indeed lose more weight - 1.4-pounds more at the end of 12-weeks. This was just what is known as statistically insignificant. I don't know about you, but if I were trying to lose weight and I lost 1.4 pounds more at the end of 12-weeks, it would matter to me. But, as I said, the benefit statistically was not actual pounds lost. It was, instead something much more important - those following the low-GI diet LOST LESS LEAN BODY MASS and MORE BODY FAT. And not just a minor difference. Hello? Anyone home? Which do you think is a healthier weight loss? Remember, Dr. Raatz said that "Low GI is not adding any magic bullet to improve weight loss." Losing significantly more body fat and significantly less lean body mass isn't better? Ms. Helm doesn't stop there though. She moves on to highlight that the committee to revise the Dietary Guidelines for Americans "dismissed" the concepts of the glycemic index, and continued with "reinforcing the notion that "calories in vs. calories out" matters most. She then takes it a step further to state that the American Diabetes Association has "not endorsed the use of the GI for weight loss." To bolster this, she quotes Marion Franz, an ADA advisor whom Helm writes is a "diabetes expert," who says that "The original intent of the glycemic index is being misinterpreted by the diet books." Franz said the concept of the glycemic index may help people with diabetes "fine-tune" their food choices, but there's little evidence it will enhance weight loss. Most of the weight-related claims - from curbing cravings to increasing energy - are unsubstantiated, she said. Here, we have an "expert" quote that puts the nail in the coffin of the glycemic index. Not only are we to believe that glycemic index offers no benefit to weight loss, but we're also now to believe that low glycemic index foods will not offer satiety value, curb cravings or increase energy. Add to that the very strong words that such "claims" are said to be "unsubstantiated." So the overall picture painted is that glycemic index offers no benefit for weight loss, is useless, does not increase satiety, doesn't help with calorie control, will not curb cravings and provides no increase in energy. You don't have to be a rocket scientist to search PubMed.com, the National Institutes of Health (NIH) database of published research. A cursory search of "glycemic index" and "satiety" returned 37 results. Dr. Ludwig: Physiological studies demonstrate that consumption of high GI/GL meals induce a sequence of hormonal changes that limit availability of metabolic fuels in the post-prandial period and cause overeating. Short-term feeding studies consistently show less satiety or greater voluntary energy intake after consumption of high compared to low GI meals. Dr. Jimenez-Cruz: Eating a lunch with a low GI index resulted in higher satiety perception. These results suggest the need to promote culturally based combined foods with high fiber and low GI. This approach might contribute to the prevention of obesity by increasing the perception of satiety while also improving metabolic control of diabetics. Dr. Kabarnova: Different metabolic consequences of the intake of individual fatty acids (polyunsaturated and n-3 fatty acids vs. saturated fatty acids), individual carbohydrates (low vs. high glycaemic index carbohydrates) and fibre should be considered during the weight management. Dr. Warren: The type of breakfast eaten had a statistically significant effect on mean energy intake at lunchtime: lunch intake was lower after low-GI and low-GI with added sucrose breakfasts compared with lunch intake after high-GI and habitual breakfasts (which were high-GI). Dr. Roberts: We examine whether the consumption of low-glycemic index (GI) carbohydrates may facilitate a reduction in energy intake in obese people attempting to lose weight. Although data from long-term studies are lacking, short-term investigations indicate that consumption of low-GI carbohydrates may delay the return of hunger and reduce subsequent energy intake relative to consumption of higher-GI carbohydrates. It seems Ms. Helms, Ms. Franz and Dr. Raatz don't exactly hold the same opinion as many of their esteemed colleagues, does it? So then, what's the real deal? For one, the research into the usefulness of glycemic index remains open to interpretation. The approach to managing diet with an eye on glycemic index shows promise yet lacks the clarity we need to effectively establish it as a guideline for consumers. This is due to the fact, as Ms. Helms article states, "[t]he GI ranking of a food also can vary dramatically depending on how you prepare it and how much you eat - which makes it difficult to nail down the actual number." One of the accurate statements in her article. This lack of clarity is exactly why continued research is critical. We now understand that the glycemic index itself has limitations as a tool. This understanding led to the further research that provided another perspective to consider - the glycemic load. Researchers are finding that the overall dietary glycemic load does indeed play a role in our metabolic response to food and thus our weight and health. In their prospective analysis of a cohort of 36,000 adults followed for 4 years, Hodge et. al found that higher-carbohydrate diets were associated with a lower risk of development of type 2 diabetes. However, the type of carbohydrate was equally important: low-GI carbohydrates reduced the risk, while high-GI carbohydrates increased the risk. Thus, low GI and low GL are not equivalent and produce different clinical outcomes. Because this issue may be confusing to some readers, it is important to clarify the difference between GI and GL. Both the quality and quantity of carbohydrate determines an individual’s glycemic response to a food or meal (2). By definition, the GI compares equal quantities of available carbohydrate in foods and provides a measure of carbohydrate quality. Available carbohydrate can be calculated by summing the quantity of available sugars, starch, oligosaccharides, and maltodextrins. As defined (3), the GL is the product of a food’s GI and its total available carbohydrate content: glycemic load = [GI x carbohydrate (g)]/100. Therefore, the GL provides a summary measure of the relative glycemic impact of a "typical" serving of the food. Foods with a GL 10 have been classified as low GL, and those with a value 20 as high GL (4). In healthy individuals, stepwise increases in GL have been shown to predict stepwise elevations in postprandial blood glucose and/or insulin levels (5). It can be seen from the equation that either a low-GI/high-carbohydrate food or a high-GI/low-carbohydrate food can have the same GL. However, while the effects on postprandial glycemia may be similar, there is evidence that the two approaches will have very different metabolic effects, including differences in ß-cell function (6), triglyceride concentrations (7), free fatty acid levels (7), and effects on satiety (8). Where I disagree with Dr. Brand-Miller is her caution that, "Our concern is that the use of the GL or "glycemic response" in isolation may lead to the habitual consumption of lower-carbohydrate diets. " Personally, I don't see a lower-carbohydrate diet as being a problem - especially when I consider the continued publication of research findings that are still showing that a lower (controlled) carbohydrate diet is safe and effective - not only for weight loss, but weight maintenance and management of a host of health issues. While this article is lengthy, it highlights how important it is to seek out information for yourself and educate yourself about what the actual data from studies shows. Opinions are not evidence and the article from Ms. Helms is littered with opinions. Not only that, it also lacks support from hard data and a full view of what a broad range of researchers are saying! Is such an approach useless, providing no benefit? Absolutely NOT! What we see here, again, is an article that looks to dismiss the research and get you to just ignore the evidence and get in lock-step with the Dietary Guidelines for Americans. I previously wrote about the same type of call for dismissal by Dr. David Katz from the Yale School of Public Health. I receive tons of email this time of the year asking for tips to survive the holidays without gaining weight. With this being my fourth holiday season since losing weight, I thought I'd share my strategy for enjoying the parties, family gatherings and get-togethers with friends during this time of the year. Throughout the year I pretty much eat a controlled-carb diet that includes anywhere from 75g to 150g of carbohydrate each day. I don't count carbs, calories or anything else - I know what I should eat and stick with it. But, during the holidays when more tempting fare is the norm, I actually reduce my carbohydrate intake to below 60g a day so I will be teetering in and out of ketosis. The one exception I made to this strategy was when I was pregnant with my son - continuous ketosis and pregnancy don't mix! What this strategy does is allow my body to primarily burn fat instead of glucose and year after year has not failed to keep my weight stable. To do this is fairly simple - eliminate the starchy stuff and pass of the sweets....enjoy the savory fare until your heart's content! My family and I recently attended a Christmas party and to give you an idea of what I ate, here is what was offered and those things I ate are in bold. Of the items in bold, I ate what I wanted and didn't worry about calories or fat or portion size. I simply enjoyed my selections and - bonus - haven't gained any weight while having a fantastic holiday season! In fact, I've dropped a few pounds! Now how many people watching their calories and having the mindset that "everything in moderation" can say the same? I'm sure there are some - but the fact is that the average person in the US gains five pounds from Thanksgiving to New Year's day. By controlling my carbohydrate I am assured I won't gain weight this season and you can too! We can consider 2005 to be the year of the whole grains. This year the government released the newly updated Dietary Guidelines for Americans and the Food Guidance Pyramid with emphasis on consuming whole grains each day. We're told repeatedly that whole grains are good for our health, are packed with essential nutrients, and reduce the risk of things like cancer, diabetes and cardiovascual disease. We're encouraged to eat more foods that are whole grain (or contain whole grains) for our health. No matter how you slice it, the problem is context - the recommendation remains encouraging you to consume a diet that is ridiculously high with carbohydrate. No matter the source, a carbohydrate - simple or complex - is a sugar in your metabolism. The only exception is insoluable fiber. Complex carbohydrates are just simple sugars holding hands, making what is referred to as a "chain" of connected sugars, thus "complex." Once you begin the process of digestion in your mouth as you chew your food, this complex chain begins to break to become the simple sugars that turn to glucose (blood sugar) in your body. Metabolic fact. No way around it. The problem with the average diet isn't that it's too high in fat. The average diet contains excessive amounts of carbohydrate. Believe it or not, the body requires no carbohydrate - unlike "essential" fatty acids (from fats) and "essential" amino acids (from proteins), there are no known "essential" carbohydrates. There exist entire populations of indigenous peoples who consume no measurable carbohydrate in their diet and have significantly fewer health problems than those of us in industrialized nations. But we continue to perpetrate this myth that carbohydrate is essential to our health and we must consume the majority of our calories each day from carbohydrate. The reason we're given is that carbohydrate provides energy, and glucose is our body's preferential energy source. And, guess what? That's true until you reduce carbohydrate and allow your body the opportunity to prefer fat for energy. The dirty little secret of your metabolism, that the "experts" don't tell you, is that your body prefers whatever fuel it has - if you give it carbohydrate, it will run on glucose...if you give it fat instead, it will run on fat. When you have body fat you're trying to lose, it does not get converted to glucose for energy even if your body is primarily using glucose for energy and has its calorie intake restricted. When you continue to eat a high carbohydrate diet as a means to lose weight, your metabolism is still primarily using glucose for your energy needs, leaving your body fat stores for use later when glucose is limited and it needs energy. With a constant intake of carbohydrates your body is given few opportunities to burn body fat for energy and will, in fact, cannibalize body protein - your muscle - to make glucose before taking from it's stores of body fat. This is one reason why those who follow a low-fat, calorie restricted diet lose higher amount of lean body mass as part of their total weight loss than those who follow a low-carb diet. Many try to say that low-carb diets are dangerous because they contain a high percentage of calories from fat. Here's what they don't tell you - when you're restricting carbohydrate and your body prefers fat for energy the fat you eat and your body fat are now the primary and preferred energy source for your body. You're burning the fat you're eating for energy! You're burning your stored body fat for energy! When you have a lot of body fat to lose, your body has a lot of stored calories at its disposal to use for energy! And, get this - once you're buring that fat for energy you're body keeps buring it preferentially as long as you keep your carbohydrate restricted. This is because without high levels of blood sugar your body continues to maintain stable levels of insulin, thus allowing the "fat burning" hormones, glucagon and growth hormones, to circulate and burn, burn, burn fat. But, but, but...doesn't your body need glucose? Of course it does and it has five different metabolic pathways to make glucose without carbohydrate! The first and most important of these when you're restricting carbohydrate is your dietary protein - the protein foods you eat will enable your body to make glucose from the amino acids they contain! This is one reason why protein intake is emphasized when you're following a low-carb diet - it ensures you have adequate intake of protein for essential amino acids and that you have a dietary source of potential glucose. More importantly, especially when it comes to weight loss, your body will not make more glucose than it needs from sources other than carbohydrate, so glucose made from dietary protein will not be stored as body fat. Are you starting to see a clear picture here of why a low-carb diet is going to work better than a low-fat, high carbohydrate, calorie restricted diet? With a low-carb diet you're specifically giving your body an opportunity to PREFER burning fat for energy. With body fat loss as the goal, doesn't it make sense to make your body burn fat? While many are going to continue to tell you to eat complex carbohydrates instead of refined carbohydrates as part of your low-fat calorie-restricted diet, I'm telling you the metabolic fact is that complex carbohydrates are still going to make excessive glucose in your body and are still going to keep your body burning glucose for energy instead of preferring fat for energy. Oh, you'll still burn some body fat - not nearly as much as if you did low-carb - and you'll also burn up lean body mass too as your body uses its stored protein to make more glucose while waiting for you to eat more carbohydrate for glucose...because your metabolism is stoked to prefer glucose. If you want to burn fat - body fat - you have to eat fat for energy and limit carbohydrate intake to keep that fire stoked while keeping your glucose lower and insulin stable to allow your body to burn up that body fat it has stored - to make it actually prefer buring fat instead of glucose! Last week, I wrapped up my part II article with, That said, there is a right way to eat controlled-carb and a wrong way. If you do not follow a controlled-carb plan correctly, you're still leaving yourself without your required nutrients. So, tomorrow I'll provide insights into doing a controlled-carb diet correctly and what pitfalls to avoid. Today, this article is going to be short and sweet - it's not difficult to eat a nutrient-dense diet that is healthy, so no need to be wordy about it. If you stick with real, whole foods and limit certain foods while losing weight, you'll be on your way to a normal weight and better health in the long-term. Ah, yes - from yesterday's article - It is also clear to me that one cannot and will not ever be able to achieve adequate intake of essential nutrients if they follow the Dietary Guidelines for Americans that insist that 55-60% carbohydrate, 10-15% protein and less than 30% fat and less than 10% saturated fat is the ideal. I've yet to meet anyone who eats each day within this ratio guideline that is both a normal weight AND free from any health issues. I stated yesterday that I believe the current dietary recommendations - those claimed to support good health and normal weight - are flawed. My belief comes from simply looking around and seeing so many people who are overweight or obese and/or in poor health. So let me start today with a definition of health. Health - that is good overall health - means you're free from disease and disorders that affect your quality of life and you're not taking any prescription or OTC medication to stabilize any condition you may have been diagnoised with. Basically your body is working just fine and you have no dysfunction that is undermining your sense of well-being. Now some will contend that good health should also include someone who feels good even though they may have high blood pressure and are taking medication or someone with any other ailment who can manage it with a prescription or over-the-counter drug each day. Feeling good does not necessarily equal good health. Looking good does not necessarily equal good health. Managing a disease/disorder/dysfunction does not equal good health. Being free of disease, disorder and/or dysfunction while feeling good and maintaining weight within an acceptable range does indeed equal overall good health. So, there is our definition. With so many "experts" repeating the recommendation that 55-60% carbohydrate, 10-15% protein and less than 30% fat is an ideal diet to strive for, over decades, you'd think we'd all be healthy wouldn't you? I contend that the current macronutrient ratio, percentage of calories based recommendations are contributing to our weight and health problems. It is simply not "normal" for large segments of the population to grow overweight or obese over time; nor is it "normal" for large segments of the population to have the types of health problems we see in the US. Of course there will always be a small percentage of the population destined to be obese - that's a given that historical data supports. Of course there too will always be a population afflicted with health ailments no matter how well they eat - that's a given that historical data supports too. But for the vast majority of us, being overweight or obese is not normal anymore than experiencing insidious, progressive degenerative disease and disorder is normal. For the most part, we are living in conditions that are highly abnormal and are directly contributing to our rates of obesity and illness. The above are just a small list of the changes we've made in our diet over the last 100-years and we're seeing the effects now. Because we have essentially abandon our traditional, whole food based diet, we're failing to meet our nutrient requirements and too easily are over-consuming calories. I believe part of this over-consumption of calories is our body's attempt to meet its nutrient requirements through triggering hunger - a "please eat more to meet the nutrient-requirements I need" from the body. A "healthy diet" is one that provides all critical, essential nutrients each day, every day - or provides enough of those we can store when food is abundant to take us through times of lean. Our dietary recommendations today fail to do this and result in a long-term chronic state of low-level malnutrition across wide swaths of our population. It doesn't have to be this way. We can eat healthy and realize the benefits of a nutrient-dense diet - normal weight and good health. To do this means dismissing everything we think we know about a healthy diet, that is the accepted consensus, and start again at the basics - the very nutrients required by our bodies and our metabolism. When you approach meal planning from the perspective of nutrient-density, an interesting thing happens - carbohydrate is reduced significantly as a percentage of calories and protein and fat increase as a percentage of calories. This is because the body's requirements for micronutrients are not based on particular foods being eaten as a percentage of calories, but on meeting actual requirements of essential nutrients to function properly. Often the very foods we're told to avoid or reduce significantly are often the ones that offer the higher levels of essential nutrients! Take cheese as an example. These are significant nutrient losses in an attempt to save just 65-calories. That's right, you're totally losing some nutrients and significantly reducing others just to save yourself 65-calories. No one is telling you this though! In my experience, and in what I have seen others experience, when you eat a nutrient-dense diet you feel better and you often lose weight without hunger and tedious calorie counting. The easiest approach that I've found, one that often meets nutrient requirements without much planning, is a controlled-carb approach. That said, there is a right way to eat controlled-carb and a wrong way. If you do not follow a controlled-carb plan correctly, you're still leaving yourself without your required nutrients. So, tomorrow I'll provide insights into doing a controlled-carb diet correctly and what pitfalls to avoid. With millions of people thinking about a weight loss diet for the new year, one question that should be asked is, 'is it a healthy plan for me'? Which brings the question, just what is the definition of a healthy diet? We're told from a number of experts that a "healthy and balanced" diet is one that is rich with carbohydrate - 55-60% of calories, low in fat - less than 30% of calories, with protein making up the rest of your calories - 10-15% of calories. For decades this has been the standard recommendation. And for decades we've grown fatter and fatter, to the point where two out of every three Americans are overweight, and one of the two is obese. Yet, the experts tell us this is not because the recommendations are flawed but because no one follows the recommendations - that too many people eat too many calories, too much fat and do too little exercise. Basically, blame the fat person...it's their fault they won't follow the guidelines for healthy eating. I've said this many times - I simply cannot accept that millions of people just don't care, or worse, just don't "get it" when it comes to eating healthy. If these millions simply didn't care or didn't understand we would not have a multi-billion dollar weight loss industry in the United States! Obviously someone out there is spending some serious cash to try to lose weight but we're not seeing any changes in the health statistics that indicate the efforts are paying off. Which begs the question - are the recommendations flawed? Think about this - imagine you buy yourself a spiffy new car. You drive it home, read all the recommendations for care of the car guide the dealer gave you and you follow them to a tee. Yet it stalls almost every day that you take it out for a drive. You go to the dealer and ask for your money back. They tell you you're not following the recommendations correctly, go back and read the guide again. This is pretty much what's happening today when it comes to defining a healthy diet and providing a guideline to the public about how to eat healthy. Anyone who has tried a weight loss diet based on the accepted consensus about healthy eating knows all too well that when they fail - that is when they regain the weight - they're told it's their own fault. They failed to follow the recommendations correctly. They're basically told to go back and re-read the instructions and try again, do not pass go, do not collect $200. Which brings me back to the question - are the recommendations flawed? I think in the never-ending quest to define what makes a healthy diet we've lost sight of the most critical key to health - nutrient-density. We set our sights on macronutrients a long time ago (carbohydrate, protein and fat) and left the micronutrients (vitamins, minerals, elements, essential fatty acids and essential amino acids) to take care of themselves in the belief that a varied diet will provide. We hear it again and again, "a healthy and balanced diet provides all nutrients," or something to that effect that has led us to believe that when we eat a particular mix of macronutrients, based on the oft repeated percentage of calories formula, we'll consume all the required micronutrients each day without fail. The problem is it just doesn't happen. Not only are millions of people in the United States overweight or obese, they're also malnourished - they're starving for critical micronutrients. Throughout 2005 a number of studies were published in various journals that highlighted population-wide deficiencies in Vitamin D, Vitamin B-12, Folate, Vitamin C, Vitamin E, Selenium, Magnesium, Potassium and others essential nutrients. Yet, no alarm bells were sounded, no one called for a review of the dietary recommendations to see if they might be a contributing factor, no one asked why or how this could happen in America. To me it is crystal clear that a healthy diet is one that is nutrient-dense and provides for all critical essential micronutrients each day. It is also clear to me that one cannot and will not ever be able to achieve adequate intake of essential nutrients if they follow the Dietary Guidelines for Americans that insist that 55-60% carbohydrate, 10-15% protein and less than 30% fat and less than 10% saturated fat is the ideal. Think about that and tomorrow I'll begin to explain what a healthy diet really is and how to eat for nutrient-density, which in turn provides for good health. There's a pesky rumor that continues to make the rounds in the media and amongst the diet "experts" - it's said that those who advocate low-carb or controlled-carb diets think calories don't count. Well now that's just silly! You just don't have to count them when you're following a low-carb diet. With millions of people potentially considering a weight loss program as their New Year's Resolution for 2006, I'd like to set the record straight on the calorie myth those who want to discourage you from trying a low-carb diet continue to put forth. Study after study shows a unique pattern amongst study participants placed on a low-carb diet - they eat less calories without counting their calories. That's right - they eat less calories without trying to eat less or counting how many calories they eat each day. In fact, a significant number of study subjects rate satiety levels as "very high" when on a low-carb diet - that is they're not hungry and do not have the urge to eat more food like they do when on a low-fat diet. If you've ever tried a low-fat diet that is calorie-restricted too, you know the hunger. It's inescapable and with you each day. That hunger is something that you simply will not experience if you try a low-carb diet and follow it properly! And, let's not forget, there are metabolic reasons why satiety is high, making you feel fuller and more likely to eat less calories on a low-carb diet without counting or thinking about your calorie intake. The first is that protein foods - which you're allowed to consume ad libidum (as much as you want) - have a high satiety value. They fill you up quickly and the bonus is that your body has a "threshold" of how much protein it will allow you to consume - you will simply be hard pressed to overeat protein. Cool, huh? The next metabolic "bonus" is that your protein and carbohydrate (that is allowed) can be eaten with whatever fat you want. You no longer have to use low-fat or no-fat dressings on your salad, trim all fat from your meats or skip the butter when cooking your eggs in the morning. Both fat and protein - unlike carbohydrate - trigger satiety signals in your stomach that tell your brain you've eaten and you've had enough - so you stop eating because you feel full. Carbohydrate foods do not trigger these same signals in the stomach, but much later in the process of digestion, which is why it's easier to overeat when you're consuming a high carbohydrate low-fat diet. The last thing that provides you with an advantage while on a low-carb diet is that you're eliminating junk foods and eating real whole foods instead. The highest volume food you'll consume (if you're doing a low-carb diet correctly) is non-starchy vegetables, select fruits and salads. No matter what low-carb diet you choose, even the strictest still requires you to eat at least, at minimum, five servings of select fruits and vegetables each day. Depending on what non-starchy vegetables you do choose, you could be eating up to ten servings or more a day. Looks to me like 4 fruit servings and 5.5 vegetable servings! 9.5 fruit and vegetable servings in a day! With 18g net carbs, this leaves 2g for carbohydrate for other foods that are allowed that have some carbohydrate, like eggs, cheese or salad dressing. And let's not forget to mention the above foods provide 21g of fiber too. Something you're also led to believe is missing in a low-carb menu. Tell me what low-fat diet requires you to eat that many fruits and vegetables each day? Tell me what calorie-restricted low-fat diet includes 21g of fiber? Oh, and you probably thought fruits were not allowed didn't you? Well, not all fruits are off limits, even on the most restricted low-carb plans. That too is another of the myths you hear! On the strictest low-carb plan pumpkin, tomatoes, olives, lemons, limes, avocado, summer squash, zucchini and macadamia nuts are all allowed and are all fruits. Using the above items as a base start for a day's menu, here is what you could eat on your low-carb diet while losing weight! Florentine Omelet made with 2 large eggs, 1/4 cup cooked spinach, 2 slices turkey bacon and 2 tablespoons shredded swiss cheese, cooked in butter. Chicken Caesar Salad made with 2 cups shredded romaine, 4 cherry tomatoes, 1/2 sliced medium cucumber, 1 cup grilled chicken breast diced, 1 tablespoon ground flax seeds, 1 ounce macadamia nuts chopped (in place of croutons), 1/2 avocado sliced and creamy caesar dressing. Dinner Salad made with 1 cup shredded romaine, 2 cherry tomatoes and creamy dressing. Shrimp Scampi made with 6-ounces large cooked shrimp, sauteed in butter, garlic and herbs (oregano, basil and parsely), with 12 sliced baby zuccini and a side dish of 3/4 cup cooked spinach. 1/2 cup broccoli florets with creamy dip. Vanilla Cream made with 2-ounces heavy cream, whipped with vanilla extract and 1 packet of artificial sweetener (optional). How many reading this have tried a calorie-restricted diet to lose weight, worked really hard to stick to it, really did stick to it, yet failed to lose any significant amount of weight? Worse, how many have had others tell you that if only you tried harder or cut calories even more you'd be successful with your weight loss? Take heart, you're not alone and may in fact have a genetic variant that induces a sort of buffer against changes in how the body burns and stores food energy. This gene variant, idenitifed in research out of Tufts University, appears to protect against weight gain in lean women - but seems to actually prevent weight loss in men and women who have become obese. When it comes to research, this is fascinating stuff! In time it is findings from studies like this that are going to allow us to customize dietary programs for weight loss in the future through testing an individual for various markers in their metabolism and genes so the diet is tailored to their metabolism! In this study, researchers followed 48 severely obese men and women who were following a low-calorie diet for one year. Subjects, who did have the more common variants of the perilipin gene lost an average of approximately 20 pounds during the study period - the amount of weight loss expected with the calorie restriction of the program. Now.....carriers of the variant gene did not experience significant weight changes in the year they ate a calorie restricted diet! "The researchers determined that the difference in weight loss between the two groups could not be explained by the fact that the variant gene carriers weighed less at the start of the study. When asked why the subjects had not lost more weight, Ordovas noted, "These subjects were closely followed during the study period and the compliance was considered to be excellent regardless of the perilipin genotype. Given the difficulty of keeping weight off long-term, the loss of 20 pounds is a significant achievement." Researchers did caution that the study was on one ethnic group and was out of Spain, "We do not know what we might find in other countries or ethnic groups." Caution was also noted that very personalized testing for this gene type is years away - "nutritional genomics is not yet in a position to contribute significantly to treatment of obese patients. But we are finally beginning to piece together how genetics might be used in the future, perhaps to help predict who is likely to respond well to dietary weight-loss interventions." Hey, at least we know that in the future we can look forward to individualized programs! I think it's safe to say we all agree that when it comes to public health issues there exist a number of enemies - obesity, cardiovascular disease, diabetes, cancer - to name a few. We are indeed in a public health crisis, with many of our health issues tied directly to our rising rates of obesity in the United States. Obesity, in my mind is public enemy number one at this time. These are sobering statistics and each number represents a real, living breathing person alive today who will not be with us as we see 2006 near its end next year. This is something we often lose sight of in the presentation of statistics - the numbers seem like just numbers and when they are presented in terms like "X per 100,000" or "X per million" the sense of the individuals these numbers represent is lost along with the reality that we may be among the statistics ourselves in the coming year. So, it was the Annual Review of Public Health article, Competing dietary claims for weight loss: finding the forest through truculent trees, from Dr. David Katz an Associate Professor Adjunct in Public Health Practice at the Yale School of Public Health, that caught my attention this morning. The abstract is short and can only be described as a less than objective review of evidence. In response to an accelerating obesity pandemic, competing weight-loss diets have propagated; those touting carbohydrate restriction are currently most in vogue. Evidence that sustainable weight loss is enhanced by means other than caloric restriction, however, is lacking. Whereas short-term weight loss is consistently achieved by any dietary approach to the restriction of choice and thereby calories, lasting weight control is not. Competing dietary claims imply that fundamental knowledge of dietary pattern and human health is lacking; an extensive literature belies this notion. The same dietary and lifestyle pattern conducive to health promotion is consistently associated with weight control. A bird's eye view of the literature on diet and weight reveals a forest otherwise difficult to discern through the trees. Competing diet claims are diverting attention and resources from what is actually and urgently needed: a dedicated and concerted effort to make the basic dietary pattern known to support both health and weight control more accessible to all. Sadly, the last sentence speaks volumes - Katz is of the opinion that research investigating dietary approaches outside the accepted dogma (high-carbohydrate, low-fat) are a waste of precious resources and divert attention from useful efforts to educate the public about weight control and health. In a review of the full publication, something pops out almost immediately - Katz seems to be of the opinion that the enemy here is not obesity and disease, but rather, the research conducted to investigate alternative approaches to weight loss and health. Perennially reinventing our destination for weight control in the form of the “hot” diet du jour is a discredit to our common sense, a digression from our cultural imperatives about confronting challenges, an indictment of our collective judgment, and a neglect of a robust base of evidence characterizing the effects of dietary pattern on the health of human beings across the life span. But it is something far worse. It is a bona fide public health threat in and of itself. One cannot offer ironclad evidence that fad diets are harmful in the long-term, simply because such long-term studies have not been conducted. They may never be conducted. The onus of proof lies with those suggesting radical departures from patterns of behavior known to support human health; the community of nutrition experts is not obligated to prove the harmfulness of every new diet proposed. In this instance, intellectual honesty would have been nice - an acknowledgement that there does not exist any long-term, random, controlled, prospective trial that supports low-fat diets for the general population. Not one. Not one study has ever been conducted to investigate the dietary recommendations made to the general population day in day out! Go look for yourself if you don't believe me - PubMed, MedScape, Cochrane Library. His recommendation for the future? Stop researching useless alternatives and everyone work together in a consensus that the 55-60% carbohydrate, up to 20% protein and 20-30% fat is the path that will lead to population-wide health and weight control! The challenge before us is determining how best to get where we need to go, not deciding where that is. The sooner we accept that we know where we should be going, the sooner we may actually hope to advance toward that destination. Stated differently- we will need to espouse a common vision of the forest through the trees before we can hope to get out of the woods. Hello? Haven't we been taking this very road for the last thirty years? The enemy here is not the research and certainly not those investigating the alternatives. No, today we face another enemy - the closed mind that believes that we already know everything we need to know about the correct macronutrient composition in an ideal diet and that anything else is flawed (or outright wrong), a waste of time to investigate and is simply just diverting attention from the "truth" we should all just accept, without question - afterall, just leaving the door open to the idea of alternative options is a public health threat! I readily admit that a controlled-carb approach is not suitable for everyone and that low-fat diets formulated within the accepted dogma 55-60:15:25-30 ratios (carb:protein:fat) do work for some and may even be the "best" dietary approach for some health problems. What I cannot and will not accept is this notion that continuing research that investigates alternate dietary approaches is a waste of our time, resources and effort. The literature continues to grow and evidence continues to mount that controlled-carb approaches (from 20g net per day to 40% of calories) are an appropriate, scientifically supported alternative for a number of individuals in our population who are obese, overweight and/or suffering from any number of medical problems. To shut the door to continued reasearch of any dietary approach that is outside the current dogma is to shut the door for those individuals who have failed on traditional low-fat approaches, have yo-yo'ed up and down with a low-fat diet, or continue to have poor health despite compliance with a low-fat diet. Such a mindset continues the notion that "if only they'd eat less and exercise more" they would be normal weight and experience good health. What we need going into 2006 isn't for the scientific and medical communities to slam the door shut to future research but to systematically work together to tease out the critical information needed to determine who is a candidate for a controlled-carb diet, what testing needs to be done while one is following a controlled-carb approach to monitor health, and what measurements can be used to track the health of the individual in the short and long term? What we need are clinical guidelines healthcare professionals can use to guide their patients and monitor health as we continue to research the long-term effects of controlled-carb diets! And, hey, if this idea of mine is a threat to public health, so be it! Something that isn't getting much play in the media but should be - the FDA has announced trans-fat labeling exemptions for food manufacturers, shielding them from non-compliance issues after January 1, 2006, the deadline for food manufacturers to include trans-fat content in the nutrition facts panel on package labels. Just how long have manufacturers known about this new requirement? For two-and-a-half years if you measure from when the FDA issued the final rules on July 11, 2003; over five years if you consider the period between contemplation of new labeling requirements in 1999 to now! The reason exemptions are being given is lame - manufacturers and their trade organizations are claiming "hardship" (financial) because they have so many labels printed in their inventory, or (get this one) they don't have a good measure of the trans-fats in their products! Since when is POOR PLANNING an excuse to ignore the law? Food manufacturers have had more than adequate time to plan their label printing needs for YEARS ahead of the January 1, 2006 deadline for compliance. Heck, some manufacturers are already using the new labels, so there is NO EXCUSE for any company not to follow the law starting January 1, 2006! And last time I looked, trans-fat levels are available in a number of public databases, including the USDA Nutrient Database...and there are hundreds of laboratories around the country that do food testing. So the excuse a manufacturer can't figure out the trans-fats in their food is ridiculous and should be unacceptable. But, we are dealing with the FDA aren't we? Folks, I am ranting here, but this decision by the FDA to allow exemptions is insane. It is continuing the "smoke-and-mirrors, don't give the consumer all the facts they need, protect the interests of industry" song-and-dance many predicted two years ago. Yup, a number of people have been saying for years that at the deadline there would be expemptions or extentions. And, here we have them. As a consumer this is something that should anger you - to save the "bottom line" of manufacturers who planned poorly their labeling needs, you now will pay with your health if you can't determine how much trans-fat a food has in it. But, manufacturers will get to save money by being allowed to continue using up all those old labels they ordered - knowing a deadline for the label change was imminent - until they use them all up. How lucky are they? Good luck consumers - you're still totally on your own trying to figure out what foods have trans-fats that are going to damage your health in the long-term. Last month I wrote about a ground-breaking paper - Carbohydrate restriction improves the features of Metabolic Syndrome. Metabolic Syndrome may be defined by the response to carbohydrate restriction - that showed the features of Metabolic Syndrome are the very same list of things that reverse with a low-carbohydrate diet - high triglycerides, low HDL (good cholesterol), high blood sugar, high blood pressure, insulin resistance and obesity. For years I've been intrigued by the improvements seen in the majority who try a controlled-carb approach for weight loss and/or improving their health. As I highlighted in my previous article, the estimate today is that 25% of Americans have Metabolic Syndrome. The disorder significantly increases their risk of heart attack, stroke and diabetes. With 1 in 4 adults in the United States suffering, we need to seriously address treatments - even ones that seem to contradict our beliefs about what constitutes a healthful diet - and get to the root cause(s) of the condition. As more data is published one major change in our diet continues to glare brightly at anyone paying attention - our intake of added sugars has increased significantly in the last thirty years with marked increased intake of fructose while we've decreased our intake of table sugar in our foods. This change is significantly impacting our health - for the worse. A review of the literature makes this clear - study after study finds fructose and high fructose corn syrup implicated in the obesity epidemic as it disrupts metabolism and sets the stage for metabolic syndrome. Just what fructose does to our metabolism is a question that researchers continue to investigate. In DeHaviland At Work Network, the article Sugar 'speeds up obesity' highlights findings from research at University of Florida, Gainsville. A research team at University of Florida said fructose - found in common sugar, processed foods and even fruit - can render the body's metabolism unable to function effectively, causing faster-than-usual weight gain. The scientists say the findings are significant as many modern, processed foods are packed with high levels of fructose. In the animal study, led by Dr. Richard J Johnson, scientists found that fructose tricked the animals into thinking they were hungrier than they really were, causing them to eat more and pile on the pounds. The scientists say fructose hampers the body's metabolism and causes a rise in uric acid in the bloodstream, which affects how the body stores and uses sugar. Consuming fructose over a long period of time, the scientists said, could lead to metabolic syndrome which causes obesity, as well as high blood pressure and cholesterol levels. It is also a precursor to type two diabetes. In the various tests conducted during the study, researchers fed rats two distinct diets. The first was a high-fructose diet and the second a low-fructose diet. The rats fed the high-fructose diet experienced increases in uric acid in their bloodstream and developed features of metabolic syndrome - specifically hyperinsulinemia, hypertriglyceridemia, and hyperuricemia. From the abstract, the researchers concluded that "These data provide the first evidence that uric acid may be a cause of the metabolic syndrome, possibly due to its ability to inhibit endothelial function. Fructose may have a major role in the epidemic of metabolic syndrome and obesity due to its ability to raise uric acid." In the DeHaviland article, Dr. Johnson said "There may be more than just the common concept that the reason a person gets fat is because they eat too many calories and they don't do enough exercise. Our data suggest certain foods and, in particular, fructose may actually speed the process for a person to become obese." Exactly what I've been saying for years now! To give you an idea of just how increased sugar and fructose intake in the diet affects health - a stunning example is found from Denmark. In 1880, the average Danish citizen consumed 29 pounds of refined sugar annually. At that time, the recorded death rate from diabetes was 1.8 per 100,000. In 1911, consumption almost tripled to 82 pounds per person, and the death rate from diabetes more than quadrupled to 8 per 100,000. In 1970's as sugar consumption continued to rise, the death rate from diabetes rose again to 10.8 per 100,000 - a trend which has continued into the 21st century with Denmark (in 2003) seeing 18.3 deaths per 100,000 from diabetes. That year the sugar consumption of the population was 120 pounds per person. Is There a French Paradox? For decades many within the scientific and medical communities have called the French a "paradox" because both their eating habits and lifestyle foster an enviable life expectancy, significantly lower rates of heart attacks, cancer, diabetes, degenerative disease, and a lower incidence of obesity in their population when compared with other industrialized nations even though their diet is high in fat (38-45% of total calories, as much as 40% of fat from saturated fats). I think one of the most striking differences is deaths from heart attacks - the very health problem we are told again and again a low-fat diet will help prevent. Put another way, if you eat and live like the French, your odds of dying from a heart attack is rare despite a high-fat diet. Yet, rather than open the door to thinking about the possibility that the French are on to something, the medical and scientific communities hold this population is a paradox - that is they should not be enjoying the health they do because they are eating and living in a style that is contradictory to everything they believe to be true. The idea the set of beliefs is flawed is an impossible idea to grasp. Which probably explains the eager reserach study to examine, over eight years, 12,741 middle-aged men and women in France to see if nutritional supplements make any difference in the rates of heart attacks or cancer while also following any changes made in diet. The results of this study, the Supplement en Vitamines et Mineroux Antioxidants (SUVIMAX) study, were published this month in Journal of the American Dietetic Association in the article, "Nutrition and Health in France: Dissecting a Paradox"
France has the longest life expectancy in the Western world (second only to Japan among developed countries). Prevalence of obesity and overweight is relatively low. In French adults, the frequency of obesity in adults was 11.3% in 2003. Overweight was present in 41.6% of adults. These figures are lower than those of many developed countries, particularly those of the United States. In the SUVIMAX population, the daily energy intake observed in 1995 was about 1,900 kcal in women and 2,500 kcal in men. Total daily energy intake has decreased linearly since the beginning of the study, not only when considering the same subjects longitudinally, but also when comparing same-age groups over time. This decrease in energy intake parallels a decrease in total fat. In 2001-2002, the percentage of participants who ingested less than 35% of their daily energy as fat had increased dramatically, in comparison with 1995-1996 (52.1% of women and 69.2% of men in 2001-2002, vs 19.4% and 34.1%, respectively, in 1995-1996). However, the nature of fats did not change over the study period and saturated fats represented 40% to 41% of total fats in both men and women. The intake of carbohydrates increased over time, particularly intake of simple carbohydrates. Fiber (about 22 g/day in men and 18 g in women), protein (16% to 18% of total energy), and alcohol (about 9% of daily energy in men, and 4% to 5% in women) intake appeared constant between 1995 and 2002. Intake of fruits increased regularly over the course of the SUVIMAX study in both men (from 235 to about 250 g/day in 2001-2002) and women (from 217 to about 230 g/day in 2001-2002). While intake of vegetables did increase over time in longitudinal comparisons of the same individuals, the comparison of same-age groups at different moments of the study indicated a decrease in vegetable intake. Over the time of the study, the percentage of participants ingesting the recommended five fruits or vegetables a day increased from 1995-1996 to 2001-2002 (14.6% to 22.5% in men; 17% to 27.5% in women). Over time, the intake of cereal products, legumes, milk and dairy products, and alcohol remained stable. In contrast, intake of animal products (meats, fish, and eggs) decreased in both men and women, while consumption of added fats was dramatically reduced (25.6 g to 15.2 g/day in men and 20.3 to 12.8 g/day in women). The striking dietary changes over time reported in the SUVIMAX participants were the large decrease in dietary fats and the increased proportions of people ingesting five fruits/vegetables a day. These changes clearly reflect nutritional recommendations made to the French public, suggesting that the efforts made by public health authorities had the desired impact. What researcher wouldn't be giddy with these dietary modifications? Ahhh, but something else happened too - those in the study got fatter! I kid you not! One very disturbing fact about the French nutrition and health situation is the very rapidly increasing rates of overweight and obesity. Although France lags behind most other countries, the rate of increase is extremely alarming. In 1997, the prevalence of obesity in the adult population was 8.2%; in 2000 it was 9.6%, and it reached 11.3% in 2003. This corresponds to a 5% increase per year. Overweight in adults rose from 36.7% to 41.6% in 6 years. Morbid obesity doubled between 1997 and 2003. All age groups are affected, with a particularly rapid deterioration in people over 65 years of age. Children are also a very vulnerable group. Children in France are not as fat as US children, but they are catching up rapidly. Again - eating less calories, less animal products, less fat, less added fat while altering the diet to include more carbohydrate, more fruit and more people eating 5-servings of fruits and vegetables each day resulted in WEIGHT GAIN in the population. Do you think the researchers were able to see the forest for the trees? Not exactly. In fact, the recommendation was this: More remains to be done, as vegetable intake could be increased and the proportion of saturated fats could be decreased in this same population. Can You See the Madness?